Once again, we are very happy to share a guest article by Veronica Arntz with our readers. Veronica earned her Bachelor of Arts in Liberal Arts from Wyoming Catholic College, and is currently pursuing her Master of Arts in Theology at the Augustine Institute. This plan of revelation [of God] is realized by deeds and words having an inner unity: the deeds wrought by God in the history of salvation manifest and confirm the teaching and realities signified by the words, while the words proclaim the deeds and clarify the mystery contained in them. By this revelation, then, the deepest truth about God and the salvation of man shines out for our sake in Christ, who is both the mediator and the fullness of all revelation (art. 2). As such, it would be impossible to accuse the Catholic Church of being a religion either entirely of words or entirely of symbols (as revealed in deeds or actions). Rather, because of the Incarnation, the Catholic faith is a religion of both word and symbol, which is particularly expressed in her sacred liturgy—both in the Holy Sacrifice of the Mass and the Divine Office. Creation is born of the Logos and indelibly bears the mark of the creative Reason which orders and directs it; with joy-filled certainty the psalms sing, “By the word of the Lord the heavens were made, and all their host by the breath of his mouth” (Ps 33:6); and again, “he spoke, and it came to be; he commanded, and it stood forth” (Ps 33:9) (art. 8). The Word spoke, and all things in creation are like his words, revealing the mystery of the Creator through their diversity. In other words, those who do not listen to the words that Christ has spoken will be their own judge, because through his words, Christ is proclaiming eternal life and the way to attain that life. Christ, as the Word, is the source of all other words—he is the source of all Truth, which is why the Scriptures are composed of divinely inspired words. The disciples transmitted Christ’s teachings through words, first through oral tradition, and then through words written down in the Scriptures. Therefore, the words of the Catholic faith are essential for understanding what the Apostles taught, which was given to them by Christ himself. The Catholic Church continues to use words as she defines dogmas, which are already contained within the words of Scripture. While it is true that words, being mere convention, do not fully convey the reality of a thing, and in some sense fall short of the reality, they are still necessary in order to give thought and shape to the truth. Indeed, some words are closer to the truth of reality than others are, which is why the Church is careful and precise when she defines dogma. For example, one thinks of the early Christological debate involving the words, homoousios (same substance) and homoiousios (similar substance). At first glance, these words might not seem to be so different, but when describing the one substance of the Father and the Son of God, the extra letter makes all the difference. Moreover, she uses words in her liturgies, to pray to God and give him thanksgiving and praise for all he has done for us. As we have already hinted, the Catholic faith is not simply about words—it is not simply a rationalist religion. Rather, it is rich in symbols and in typology, revealed through Christ’s action and fulfillment of the Old Covenant. Yet the words and the symbols are directly related; in the Church today, Dr. Peter Kwasniewski writes that we are experiencing “spiritual illiteracy.” “Once the language of symbols is abolished [as occurred with the iconoclasm following the Second Vatican Council], the people cannot read the symbols any more, and are therefore cut off in principle from access to the riches of the Church.” Here he speaks of understanding symbols in literary language: the symbols of the Church are to be read, and thereby understood. In other words, symbols are rich in meaning, which means that we can “read” multiple layers of significance in them. As he continues, “Up until quite recently, Catholics grew up with the language of the Church—her pageantry of symbols, her liturgical rites and special music and cycle of feasts and fasts, her catechism.” Dr. Kwasniewski laments that these symbols are foreign to many Catholics, because they have not been fully initiated into the use and understanding of them. What, then, is a symbol? A symbol is a sign that points beyond itself to a greater meaning. Within the Sacred Scriptures, we find many symbols that point forward to the coming of Christ. For example, Moses is a symbol, or a type, of Jesus Christ, because he is the giver of the law to the people of Israel. Moreover, he speaks with God face-to-face, as with a friend (Exod 30:11). Moses, therefore, is a type of Christ, because Christ is the giver of the New Law of the New Covenant, and in Christ, we behold the face of God. Since Christ became incarnate, God now has a human face, and we can speak to him as Moses did with God on the mountain. “For the law was given through Moses; grace and truth came through Jesus Christ” (John 1:17). The Crucifix is also a symbol for the Catholic faith, a sign of Christ’s sacrifice for the redemption of mankind; every time we see one, we are reminded of Christ’s sacrifice, and our sinful human nature. In the Holy Sacrifice of the Mass, symbol and word are united. In the Asperges me, the choir chants the words of the hymn that describe our cleansing from sin: “Thou shalt sprinkle me, O Lord, with hyssop, and I shall be cleansed; Thou shalt wash me, and I shall become whiter than snow. Have mercy on me, O God, according to Thy great mercy.” Meanwhile, the priest sprinkles the people with baptismal water, a rewashing in the waters of baptism to be cleansed from sin. 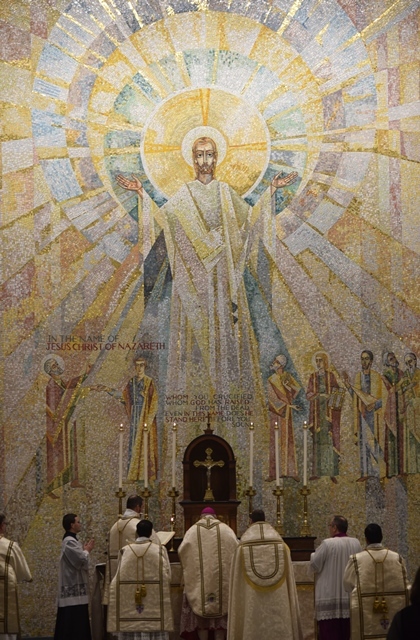 The incensing of the altar symbolizes the Offertory itself; the incense rises like a prayer to the heavens, the prayerful act of the faithful and the priest that God might bestow his mercy on them and on the whole world. The Mass ends with the Last Gospel, the Prologue of the Gospel of John, which reminds the faithful to give praise and thanksgiving to the Incarnate Word, who by his Passion, Death, and Resurrection brought salvation to all who would choose to follow him. Moreover, the vestments, the polyphony, the architecture—all of these symbols are meant to point to Christ, the Word Incarnate. In so many of our modern churches, we see what Kwasniewski writes of in the article cited above: a removal of so many of the Church’s beautiful symbols, to the point that very few people can recognize them anymore or their significance. Altar rails, ornate statues, baldacchinos, among many other things, were removed from the churches shortly after the Second Vatican Council. This meant that they were absent from the consciousness of the people, and have been so for a whole generation or more. These traditions of the Church, all of which were oriented toward giving glory to God, were replaced with postmodern pseudo-decorations, which did not point the worshipper to Christ, but rather, back to himself. The idea was to make everything within the Church more comprehensible by modern man, but by making everything so understandable, the worshipper has since lost interest, because he is surrounded by those things he encounters on a daily basis. Rather than being elevated to the sublime, the modern worshipper encounters only those things he sees in his daily life at the office and in the world. Thus, when the Church fully unites her tradition of symbols and her tradition of words in the Mass, she is able to speak to man’s deepest longing to be united with God, who transcends him and his mundane activities. What does this mean for the Church in the postmodern world? The Church ought to embrace the fullness of her traditions, both in her words and in her symbols. Because of Christ’s Incarnation, she is able to speak through both words and symbols—Christ gives meaning to both of them. The Church can do a great service to the people if she returns to the fullness of words and symbols, for the people are starved for meaning in their churches and their liturgies. Rather than catering to the needs of “modern man”, the Church can give him the richness and deepness of her traditions, most especially realized in the Holy Sacrifice of the Mass.